Almut and I have known each other for many many years. We actually grew up in the same town, went to the same secondary school and spent many afternoons at each other's houses. We played computer games together, ran around in the woods near her house and once we even went to summer camp together. However, as it often happens, towards the end of high school we largely lost touch because we both moved elsewhere. For many years we didn't stay in touch regularly and our paths separated. We both studied and went abroad - I ended up in Spain, she now lives in the US - but you know, something quite amazing and unpredictable happened that brought our paths back into alignment: We both became obsessed with photography! Last year when Almut sent me some of her pictures after a few years of silence I was blown away. Despite the distance, that space of years and miles between us, it almost felt as if I could have recognised her unique vision immediately. If I had to describe her work in one word, then it certainly would be this: Brave! Half the things she does I wouldn't dare and I have lived and worked in my share of rough neighbourhoods! Her photographs are spontaneous, and yet have a hesitant perfectionism about them that reveal the level of deliberation that goes into them. In fact, her way of working is largely the opposite of mine - I am an obsessive shooter, who can fill a roll of film before Almut even sees something that inspires her to take her camera out. And sometimes she might just leave the camera in the bag altogether. The pictures she ends up taking subtly bury themselves into one's subconscious, like that man with the hulk hand or her strange urban fairy. Quite often it is not the first but the second glance though that reveals her pictures for what they really are: Meditations over situations, places and minute details that almost, but not quite, seem to unravel the mysteries of this barely understandable world. First of all, how did you get into photography and what is your favourite subject matter? I started taking photographs when my dad gave me his old Praktica some years ago. I instantly became fascinated with film, because I love the anticipation of how my pictures may have turned out and I think it gives pictures some sort of honesty, if you only have a few tries to get things right. I did not get too serious about it until I moved to the United States, however, so I am still learning. My favourite genre is street photography. One of my first pictures was taken in Grenoble, France, during a strike (which happens on a daily basis in France). The emotions and coherence of that group demonstrating for a common cause captured my attention and I started taking images of strangers and their surroundings. In 2011, I moved to Detroit where there is immense financial, cultural and racial segregation and quite interesting city dynamics. The city is a pretty rewarding theme for street photography, there are many interesting characters and situations. 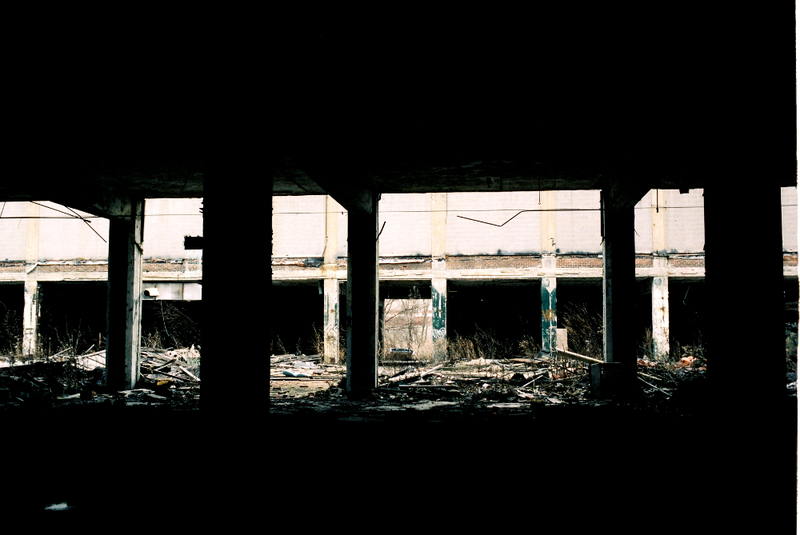 I also take images of the decay of historic buildings in Detroit, like the old automotive industry plants or theatres. Unfortunately, that can be risky, and I don't always find a "partner in crime" to accompany me. I guess even walking into some of these buildings with a friend might still be dangerous enough! Now that you mention risk, how do you feel about shooting street in a place like Detroit? What I'm getting at is whether you have any strategies how you try to minimise the risk. Does it always feel risky or do you get used to the dynamics of the place? I definitely find it quite brave to point a camera at a stranger in a place like Detroit, especially when it's a big SLR like yours! That reminds me of a quote, “Bravery is the capacity to perform properly even when scared half to death”. I mention that, because I am often accused of having a false sense of security, when in fact I am easily scared. If you asked me whether Detroit is a dangerous place, I'd say: “Yes, definitely”. But fear is also one of Detroit's many problems. It creates a mental disconnection between the suburbanites and the city. And let's be honest, Detroit also has many beautiful parts and there are many organizations and initiatives to improve the situation. It is not all hellmouth. I feel great about shooting in Detroit, not because I am a lunatic, but because I want to create a connection that is more than geographic. I like being in Detroit, and so far my attitude has allowed me to gain insight into strangers' lives, whose paths I would not have crossed otherwise. Certainly you get used to the dynamics of Detroit. I know my way around now and I am comfortable with being uncomfortable from time to time. Regarding the risk avoiding strategies – Honestly, I don't really have any, other than common sense rules. Occasionally, I ask for permission before I take a shot. Generally, I found seeking permission to be gravely counterproductive, though. I lost count of how many times I have been offered permission in exchange for some shady business. One time a homeless drunk insisted that I kiss him and repeatedly shouted “This is how we do it in America, we all love each other, we all kiss each other”. I surrendered that shot. I found that it is safer (and more authentic) to just take the picture, and so far it has proven a good strategy. You mentioned that the medium of film gives your pictures an honesty that might be lacking otherwise. Do you mean by that a more immediate appreciation for the moment that allows you to stay closer to your subject? Or is it rather a more "technical" honesty? After all with film it gets quite expensive to just "spray and pray" and you definitely need a certain level of skill to make those few attempts count! I would not claim that 'honesty' is necessarily lacking, if you don't use film. I think you can take splendid images with any type of camera. For me, a digital camera just makes it harder. One is tempted to take hundreds of shots of a certain situation and then pick out the best of the best, the perfect image, but it's not reality. When I use film, I have to assess whether a situation is really worth capturing and I have to do it quickly and then take the shot. This is what I mean by 'honesty'. Maybe 'authenticity' is a better word. The combination of film and street photography brings with it some disappointment about lost chances, but is immensely rewarding when it works out. Then you obtain a photograph of one moment, of how it really happened and that makes me happy. Coming back to Detroit, do you notice a difference between shooting there and taking pictures in comparatively "safe" environment, for example while travelling? Does a safe environment change your shooting style for example? One difference that I noticed while travelling to other American metropolises is that they are much more crowded than Detroit. That gives me more ‘freedom’, because it seems easier to take images without being noticed in these cities. San Francisco and Chicago were so busy and full of people that nobody really paid much attention to the things going on around them. It is a nice change to shoot in the anonymity of these cities once in a while. In Detroit, I am definitely more careful and aware of potentially unsafe situations. Would you say that Detroit is a good place for street photography though, despite the risks involved? For me it is an inspiring city and it has motivated me to take up street photography in the first place. It is easy there to photograph people that I find fascinating and situations that I want to capture. Perhaps, because many things are quite different in Detroit compared to other cities. Our hometown too has been a declining, formerly industrial city, but it has managed to turn itself around a bit more. And undoubtedly, Detroit is a great place for urban exploring - the selection of abandoned buildings is literally almost limitless. My street photographer’s heart sure beats for the Motor City. Almut is a founding member of the street photography collective Temp, the main aim of which is to facilitate cooperative projects among its members. She is also currently working on a long-term project that contrasts Detroit with the suburbs. To see more of Almut's work, visit her blog Tales of the Street.